The accusations irked Mr. Pérez to the end. “If we had wanted to kill someone that day, we would have already done it,” he said. Even as the authorities closed in on Mr. Pérez this month, he was confident he would continue to outsmart them. “We’re always one step ahead of them, thanks to the people who are helping us, my intelligence team that’s inside the institutions,” he said. Before going to bed the night of his death, Mr. Pérez messaged The Times again. “Lovely, I’ll let you know,” he said, referring to setting a time for the next interview. It was 12:45 a.m. In the early hours of Monday morning, Mr. Pérez posted a video to his Instagram account. Government troops had found him. At first no shots are heard on the video. Mr. Pérez calls out to a military major who stands outside, telling the rebel to give up, saying that the state has won. Mr. Pérez says he won’t surrender because he fears they will kill civilians in the building. Everyone seems calm. But the videos soon show a scene of chaos. Óscar Pérez was killed on Monday after authorities cornered him in his hideout outside of Caracas. He had uploaded several videos on social media in the hours before his death saying that he wanted to surrender. By BARBARA MARCOLINI on Publish Date January 16, 2018. Photo by Inaki Zugasti/Agence France-Presse — Getty Images. Mr. Pérez looks into his phone, blood streaming into his right eye. He urges Venezuelans to take to the streets immediately. Bullet holes mark the wall and gunshots are heard in the background. He says that he is offering to surrender but that the government is launching grenades. In one video, Mr. Pérez concedes that his time is up. 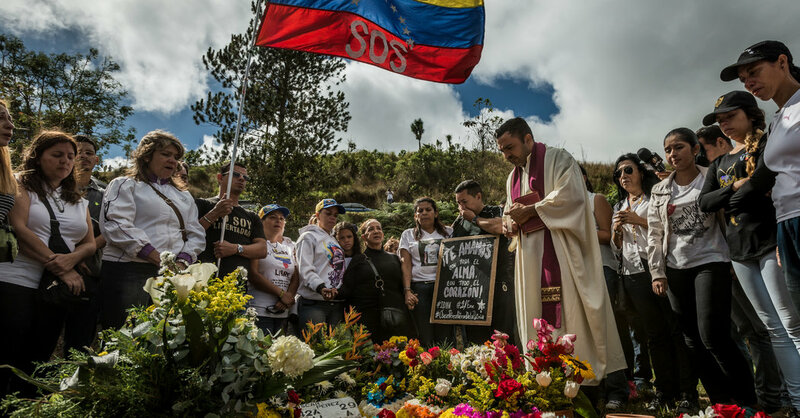 Later that morning, Venezuela’s government said the group had been “dismantled.” Mr. Pérez and six others there were dead. Two police officers were killed, officials said. Mr. Pérez’s death, shown on Instagram, transfixed Venezuela, making his last moments his final public spectacle. And almost like in a film, the threads of the life that had led him to rebellion seemed to come together one last time. Mr. Pérez’s body, bloodied and still wearing a vest, was hauled to the morgue. There it sat, not far from the place where he had identified the corpse of his brother the year before — and made up his mind that it was at last time to act.